Tonight I made a soup of my own making, borrowing snippets of other recipes as a base, then adding my own ingredients to come up with something new to us. 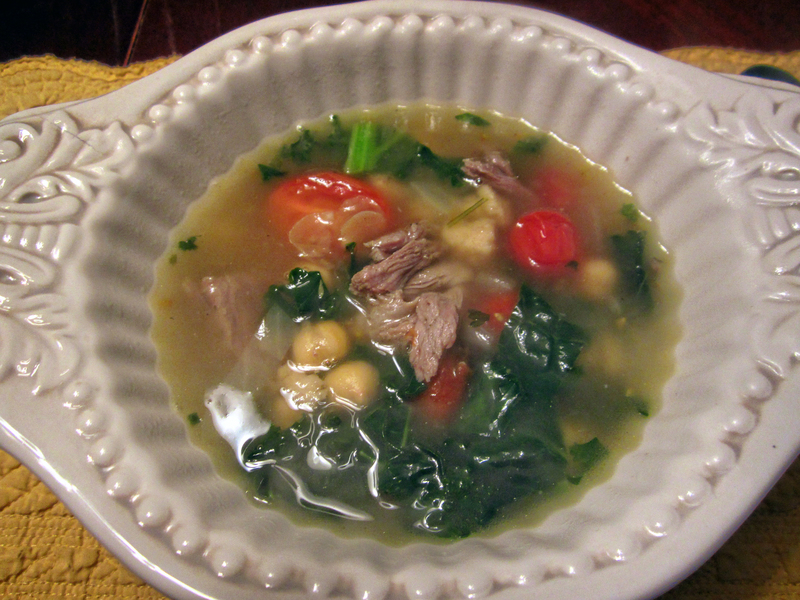 This is a wonderful soup that is much different from the traditional lamb stew recipe. Place lamb shank (with bone), chicken stock and water in a large pot. Bundle the parsley, thyme, parmesan cheese heel, and prosciutto end in cheese cloth. Add it and garlic, onion. Bring to a low boil slowly….should take about an hour…you don’t want it to boil too fast/quickly, or broth will become cloudy. Reduce to a simmer and allow to cook for 2 hours at a minimum (alternatively, you can cook this in a crock pot on low heat all day). Remove the cheese cloth bundle. Toss cherry tomatoes with olive oil. Line a baking sheet with parchment paper. Place the tomatoes on the paper, spread them out, and broil until slightly blistered. Remove bone from pot and cut meat into bite-sized pieces (or, just allow it to pull apart with a fork). Stir in chickpeas, tomatoes and kale. Simmer until kale is wilted, but still bright green, about 5 minutes. Salt and pepper to taste. Just had leftovers for lunch…Wow, the broth is even tastier the next day!